ICM is provided as a Docker image, which you run to start the ICM container. Everything required by ICM to carry out its provisioning, deployment, and management tasks  for example Terraform, the Docker client, and templates for the configuration files  is included in this container. See Launch ICM for more information about the ICM container. The system on which you launch ICM must be supported by Docker as a platform for hosting Docker containers, have Docker installed, and have adequate connectivity to the cloud platform on which you intend to provision infrastructure and deploy containers. Before using ICM with one of these platforms, you should be generally familiar with the platform. You will also need account credentials; see Obtain Security Credentials for more information. ICM can also configure existing virtual or physical clusters (provider PreExisting) as needed and deploy containers on them, just as with the nodes it provisions itself. ICM supports deployment of containers on nodes running enterprise-level operating system platforms supported for the purpose by InterSystems, currently Red Hat Enterprise Linux, version 7.4 or 7.5, Ubuntu 18.04 or later, and SUSE Enterprise Linux 12.3 or later. Docker images created by InterSystems are supported on the Supported Server Platforms listed in InterSystems Support Platforms and on Red Hat Enterprise Linux, SUSE Enterprise Linux, Ubuntu, and CentOS for development. ICM deploys one InterSystems IRIS™ instance per provisioned node, and the role that each instance plays in an InterSystems IRIS configuration is determined by the Role field value under which the node and the instance on it are provisioned, deployed, and configured. The Mirror field, which determines whether mirroring is configured, appears in the defaults file; it is covered at length in ICM Cluster Topology. In a sharded cluster, the DM node represents the shard master data server and AM nodes represent shard master application servers, along with the shard data servers (DS nodes) and optionally the shard query servers (QS nodes). 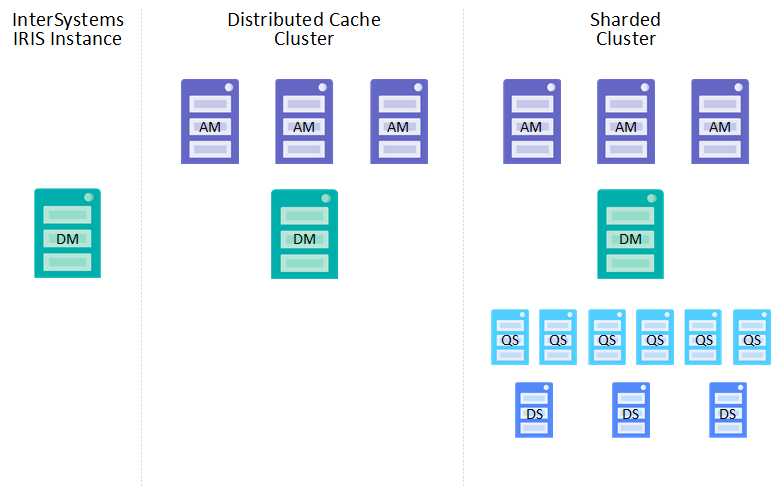 If a DM node and AM nodes are deployed without shard data servers (DS nodes), the DM node is instead configured as the data server in a distributed cache cluster, and the AM nodes as application servers. If a DM node is deployed without either AM or DS nodes, it becomes a stand-alone InterSystems IRIS instance. ICM also provisions and deploys web servers and load balancers as needed, and arbiter nodes as part of mirrored configurations. For more information about ICM node types and the ways in which they can be configured together, see ICM Node Types and ICM Cluster Topology. For detailed information about InterSystems IRIS sharded and distributed caching architectures, see the Scalability Guide. The provisioning, deployment, and configuration work done by ICM is determined by a number of field values that you provide. For example, the Provider field specifies the provisioning platform to use; if its value is AWS, the specified nodes are provisioned on AWS. Some can be specified on the command line (see Command Line). All can be included in the two configuration files (see Configuration, State and Log Files), although some can appear only in the defaults.json file, and others intended for the definitions file only.. This avoids repeating commonly used fields while allowing flexibility. The defaults file (defaults.json) can be used to provide values (when a value is required or to override the defaults) for multiple deployments in a particular category, for example those that are provisioned on the same platform. The definitions file definitions.json) provides values for a particular deployment, such as specifying the nodes in the cluster and the labels that identify them, but can also contain fields included in the defaults file, in order to override the defaults.json value for a particular node type in a particular deployment. Specifying a field value as a command line options let you override both configuration files in the context of a particular command in a particular deployment. 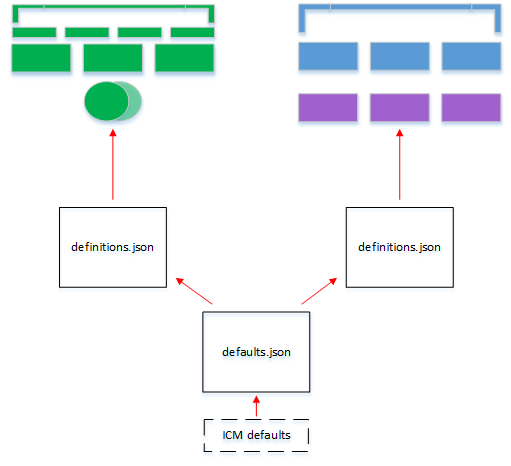 The following illustration shows three deployments sharing a single defaults.json file, while two also share a definitions.json file. For the latter, different InterSystems IRIS namespaces are created during deployment by adding an option to the icm run command. For a list of all fields and definitions of their values, see ICM Reference. The ICM command line interface allows users to specify an action in the orchestration process  for example, icm provision to provision infrastructure, or icm run to deploy by running the specified containers  or a container or service management command, such as upgrading a container or connecting to InterSystems IRIS. ICM executes these commands using information from configuration files. If either of the input configuration files (see Configuration, State and Log Files) is not specified on the command line, ICM uses the file (definitions.json or defaults.json) that exists in the current working directory; if one or both are not specified and do not exist, the command fails. For a complete list of ICM commands, see ICM Reference. icm sql -role DM -namespace namespace -command "query"
Options can have different purposes when used with different commands. For example, with the icm run command, the -container option provides the name for the new container being started from the specified image, whereas with the icm ps command it specifies the name of the existing deployed containers for which you want to display run state information. For comprehensive lists of ICM commands and command-line options, see ICM Commands and Options. As input, configuration files provide the information ICM needs to execute tasks, such as the types and numbers of nodes to provision. These files are provided by the user; they can be adapted from the template provided with ICM, created manually, or produced by the output of a script or UI. As output, files generated by ICM describe the results of ICM’s tasks. A degree of forward- and backward-compatibility among ICM versions is supported. The work required to use one configuration file with multiple providers is minimized. Although the JSON standard does not provide a formal means of commenting out content, fields can be commented out by altering their names. The definitions file and the defaults file, provided by the user as input to ICM’s provisioning and deployment phases. By default these files are assumed to be in the current working directory. The instances file, generated by ICM at the end of the provisioning phase and used as input to the deployment phase. By default this file is created in the current working directory. The Terraform state files, generated by ICM during the provisioning phase and used as input to future infrastructure-related operations, such as unprovisioning. By default these files are placed in a state directory generated by ICM under the current working directory. ICM also generates a number of other log, output, and error files, which are located in the current working directory or the state directory. The definitions file (definitions.json) describes a set of compute nodes to be provisioned for a particular deployment. The file consists of a series of JSON objects representing node definitions, each of which contains a list of attributes as well as a count to indicate how many nodes of that type should be created. Some fields are required, others are optional, and some are provider-specific (that is, for use with AWS, Google Cloud Platform, Microsoft Azure or VMware vSphere). Most fields can appear in this file, repeated as need for each node definition. Some fields, however, must be the same across a single deployed configuration, and therefore cannot be changed from the default, or specified if there is no default, by entries in the definitions file. The Provider field is a good example, for obvious reasons. Another field that must be in the defaults file is Namespace, which specifies the user namespace to create on deployed InterSystems IRIS instances; default globals and routines databases of the same name are created as well. (If unspecified, Namespace defaults to USER.) The user namespace also becomes the default namespace for the icm session and icm sql commands, and its default globals database is used for persistent storage (outside the deployed container) of instance-specific InterSystems IRIS data (see Durable %SYS for Persistent Instance Data in Running InterSystems IRIS in Containers). Other fields that cannot be included in the definitions.json file and will cause an error if they are include Label and Tag. The following shows the contents of a sample definitions.json file for provisioning a distributed cache cluster consisting of a data server ("Role": "DM""), three application servers ("Role": "AM"), and a mirror arbiter node ("Role": "AR") on AWS. The DataVolumeSize field appears here only for the DM nodes here because the others use the ICM default value. The DM node and AR node definitions include an InstanceType field overriding the default instance type specified in defaults.json. The AR node definition includes a DockerImage field overriding the one in defaults.json because it an arbiter container will be deployed on it, rather than an InterSystems IRIS container. Some fields must be in definitions.json because they are restricted to certain node types; for example, if LoadBalancer is set to True for nodes of type application server (AM) or web server (WS), a load balancer is automatically provisioned, but applying this setting to other node types causes errors. Generally, the defaults file defines fields that are the same across all deployments of a particular type, such as those provisioned on a particular cloud platform. As noted in The Definitions File, while most fields can be in either input file, some must be the same across a deployment and cannot be specified separately for each node type, for example Provider. In addition to these, there may be other fields that you want to apply to all nodes in all deployments, overriding them when desired on the command line or in the definitions file. Fields of both types are included in the defaults.json file. Including as many fields as you can in the defaults file keeps definitions files smaller and more manageable. The format of the defaults file is a single JSON object; the values it contains are applied to every field whose value is not specified (or is null) in a command line option or the definitions file. The following shows the contents of a sample defaults.json file used with the sample definitions.json file provided in The Definitions File. Some of the defaults specified in the former are overridden by the latter, including OSVolumeSize, DataVolumeSize, and InstanceType. The instances file (instances.json), generated by ICM during the provisioning phase, describes the set of compute nodes that have been successfully provisioned. This information provides input to the deployment and management phase, and the file must therefore be available during this phase, and its path provided to ICM if it is not in the current working directory. By default, the instances file is created in the current working directory; you can change this using the -instances option, but note that if you do you must supply the alternate location by using the -instances option with all subsequent commands. While the definitions file contains only one entry for each node type, including a Count value to specify the number of nodes of that type, the instances file contains an entry for reach node actually provisioned. For example, the sample definitions file provided earlier contains three entries  one for three application servers, one for two data servers, and one for an arbiter  but the resulting instances file would contain six objects, one for each provisioned node. All of the parameters making up each node’s definition  including those in the definitions and defaults file, those not specified in the configuration files that have default values, and internal ICM parameters  appear in its entry, along with the node’s machine name constructed from the Label, Role, and Tag fields), its IP address, and its DNS name. The location of the subdirectory for that node in the deployment’s state directory is also included. ICM relies on the state files it creates for accurate, up to date information about the infrastructure it has provisione; without them, the provisioning state may be difficult or impossible to for ICM to reconstruct, resulting in errors, and perhaps even the need for manual intervention. For this reason, InterSystems strongly recommends making sure the state directory is located on storage that is reliable and reliably accessible, with an appropriate backup mechanism in place. Note that if you use the -stateDir command line option with the icm provision command to override the default location, you must continue using the -stateDir option to specify that location in all subsequent provisioning commands. ICM writes several log, output and error files to the current working directory and within the state directory tree. The icm.log file in the current working directory records ICM’s informational, warning, and error messages. Other files within the state directory tree record the results of commands, including errors. For example, errors during the provisioning phase are typically recorded in the terraform.err file. When an error occurs during an ICM operation, ICM displays a message directing you to the log file in which information about the error can be found. Before beginning an ICM deployment, familiarize yourself with the log files and their locations. Each image deployed by ICM is pulled (downloaded) from a Docker repository. Many Docker images can be freely downloaded from public Docker repositories; private repositories such as the InterSystems repository, however, require a Docker login. The DNS name of the server hosting the Docker repository storing the image specified by DockerImage. If this field is not included, ICM uses Docker’s public registry located at registry-1.docker.io. If the repository specified by DockerImage does not exist on the server specified by DockerRegistry, deployment fails and returns an error. The username to use for Docker login. Not required for public repositories. If this field is not included and the repository specified by DockerImage is private, login fails. The password to use for Docker login. Not required for public repositories. If this field is not included and the repository specified by DockerImage is private. ICM prompts you (with masked input) for a password. If the value of the DockerPassword field contains special characters such as $, |, (, and ), they must be escaped with two \ characters; for example, the password abc$def must be specified as abc\\$def. You may want to set up a Docker repository so you can store InterSystems images (and your own images) locally rather than relying on the network availability for critical applications. For information on doing this, see Deploy a registry server in the Docker documentation.